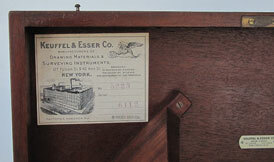 Research indicates that David Baker began his manufactory on the outskirts of Boston in 1873. 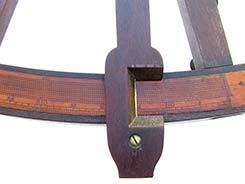 The majority of his compasses were 4 ½, 6 ½ and 7 1/8 inches in diameter. We know of no larger examples. Known serial numbers range from 2808 to 3168. Many surviving examples exhibit damage and/or toning on the interior. 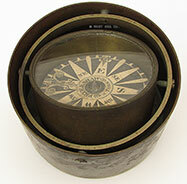 Baker received a patent for his so-called “Axial Balance, Always Steady” compass in 1896. 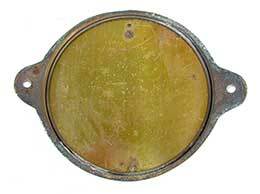 The extant example bearing these marking has an illegible 4 digit serial number possibly staring with a “3.” Accordingly the example offered here is certainly one of his earliest. 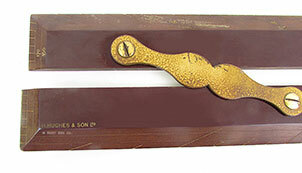 The origin of the sand timers is unclear, although they are generally attributed to the Arab world. From ancient times the passage of water was used as a measurement of time in water clocks, also known as “clepsedras.” As a carryover, the "fluid dynamics" of flowing sand was seen to be similar. By the Middle Ages the sand-glass came into its own, fragile though it was, it was the first clock which the men who made the great voyages of discovery took with them." 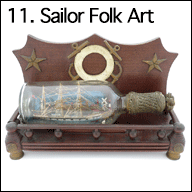 (Jean Randier, "Nautical Antiques for the Collector, 1977, Doubleday & Co., New York, page 96). 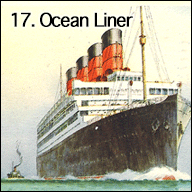 In early times the length of the log-line was measured directly by sailors as it passed through their hands. 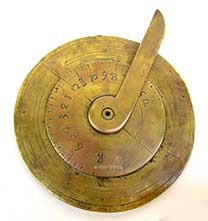 With the introduction of the nautical mile (6,000 feet) as a standard unit of measure at sea in the 15th century, they began to mark the line at equal intervals proportional to the nautical mile relative to the time interval used for measurement. At first the markings were simply knots in the line. Later, sailors inserted identifying markers into the knots in their log-line. Most ships used knots spaced 7 fathoms (42 feet) apart. The resulting time interval was directly related to the distance between knots in the line. 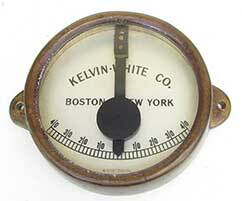 Using 6,000 feet (2,000 yards) for 1 nautical mile, the above formula yields 28 seconds for a distance of 7 fathoms. With the advent of steam navigation and much faster vessels, the interval of time needed to measure the chip log’s travel was shortened. 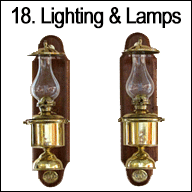 Accordingly, 14 second timers were introduced in the second half of the 19th century. 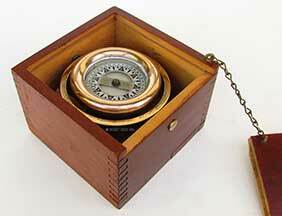 The use of 14 second timers was still being used as a back-up navigational aid well into the 20th century. 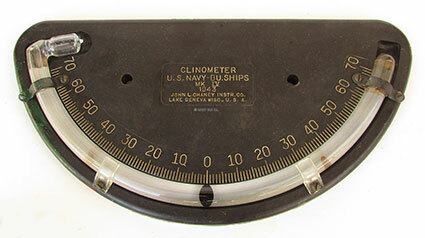 Primarily used to determine LAN (Local Apparent Noon) the azimuth instrument is an effective tool for determining the ship’s latitude by measuring the sun’s altitude at the exact time of meridian passage. 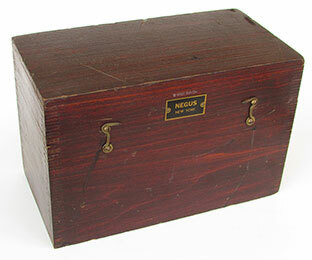 The Negus firm first appeared in the New York City directories at 84 Wall Street in 1850. 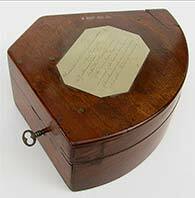 Thomas Stewart was trained as a chronometer maker in England and began working with his brother, John David in 1848, first under the name of Thos. S. Negus & Co. During the Civil War the firm moved to 100 Wall Street and the name changed to T.S. & J.D. Negus. 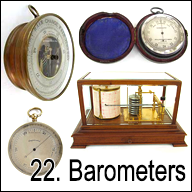 The business of chronometer and navigational instrument making continued to grow, causing them to move to 69 Pearl Street in 1875. 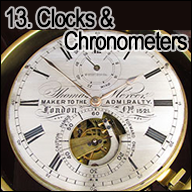 From the Civil War onward, Negus enjoyed the patronage of the U.S. Navy as the suppliers of chronometers and other navigational equipment. By the early 1900’s T.S. & J.D. 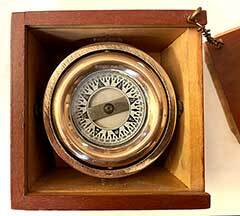 Negus had established themselves as the leading nautical instrument makers and chandler in the United States. 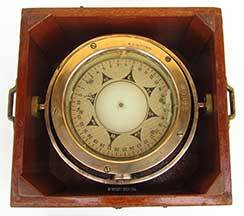 In 1962 the firm was purchased by Max Low & Co. Low found success in providing the government with navigational instruments, clocks and deck watches during World War II. Max Low’s son, Charles, continued the business in New York through the 1980’s when the firm was finally dissolved. 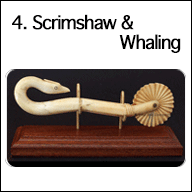 Robert Shaw was a respected nautical instrument maker and ship chandler in New York City in the early 1800’s. 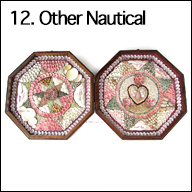 We have sold examples of navigational octants with his signature. JOHN L. CHANEY INSTR. CO. The backstaff could be used to measure the altitude of the sun or the moon. 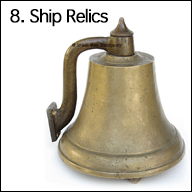 It was invented by the English navigator Captain John Davis who described it in his book “Seaman's Secrets” in 1594. Up to that time such measurements had to be taken by a cross staff which required the observer to look directly at the sun with obvious ill effects. 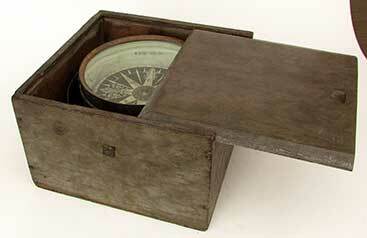 An alternative method was the mariner’s astrolabe. 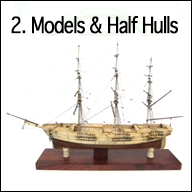 But it only provided an accuracy to within a degree – or 60 nautical miles, explaining why so many shipwrecks occurred in the early days of sail. 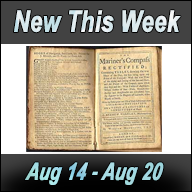 Adington D. Frye and Robert Ludlow Shaw formed a partnership which was listed in the New York City Directories as mathematical instrument makers at 222 Water Street in 1837 and 1838. The New York State Directory lists the firm in operation from 1840-1845. 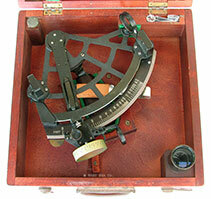 (Charles E. Smart, “The Makers of Surveying Instruments in America Since 1700,” 1962, Regal Art Press, Troy, NY). The decorated east point on the compass rose found its beginnings in the early Crusades as warriors battled their way East in search of the Cross. 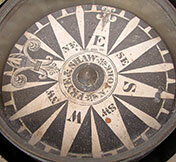 Early compasses were embellished with a cross on the east point reminding Crusaders of their goal. 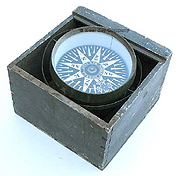 As time went on the cross gave way to a more secular embellishment, but the tradition of a “decorated” east point continued for centuries, finally falling out of favor with compass makers in the early 1800’s. 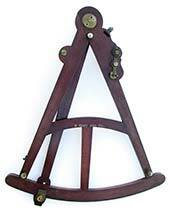 Edward Troughton introduced his innovative pillar frame design in 1788. Functioning much like the trusses of a bridge, it provided rigidity for greater accuracy and lighter weight for ease of use. 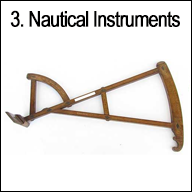 The design was immediately embraced by mariners and Troughton’s contemporaries at the time when such instruments were transitioning from wood to brass. 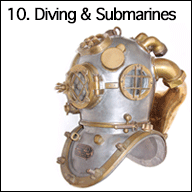 Brass had evolved as the material of choice because of its stability in a marine environment. 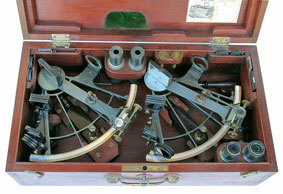 Troughton’s design was copied by a number of nautical instrument makers in the early 1800’s. However its complexity and high cost finally led to its extinction by the middle of the century. 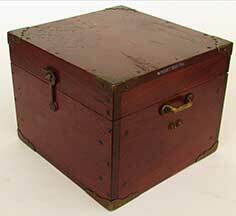 Provenence: Inlaid into the lid of the box is a brass plate engraved “LIEUT. J. R. LE HUNT WARD RN.” Some in depth research certainly could reveal much more interesting history. 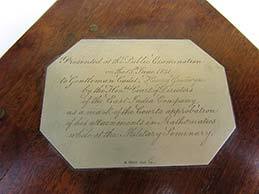 The British Naval Registry documents the service of the officers in HM Navy. The East India Company, also known as the Honourable East India Company or the British East India Company was formed to pursue trade with the "East Indies" (present-day Southeast Asia), but ended up trading mainly with Qing China and controling the Indian subcontinent. Originally chartered as the "Governor and Company of Merchants of London trading into the East Indies", the Company accounted for half of the world's trade in basic commodities such as cotton, silk, indigo dye, salt, saltpeter (for gun powder), tea, and opium. 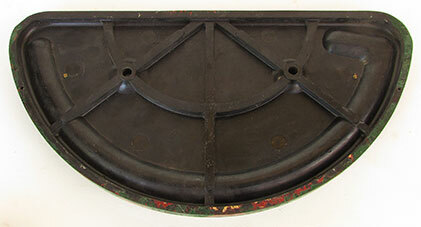 The Company was also instrumental in the founding of the British Empire in India. 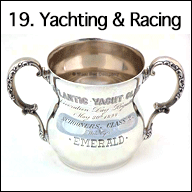 The Company received a Royal Charter from Queen Elizabeth I on December 31, 1600, making it the oldest among several similarly formed European East India Companies. 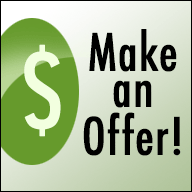 Wealthy merchants and aristocrats owned the Company's shares, but the government owned no shares and had only indirect control. 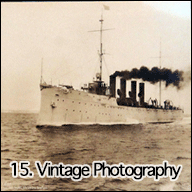 During its first century of its operation, the Company's focus was on trade, not the building an empire in India. But early in the 18th century when the Mughal Empire began to decline, Company interests turned from trade to territory as the East India Company competed with its counterpart, the French East India Company. By 1803, at the height of its rule in India, the Company had a private army of about 260,000, twice the size of the British Army! The Company eventually came to rule large areas of India with its private armies, exercising military power and assuming administrative functions. Company rule in India effectively began in 1757 and lasted until 1858. But following the Indian Rebellion of 1857, the resulting Government of India Act 1858 led the British Crown to assume direct control of the Indian subcontinent in the form of the new British Raj. Despite frequent governmental intervention, the Company's on-going financial problems finally led to its dissolution in 1874. The quaint seaport town of Trieste is located on the extreme northeastern border of Italy, at the head of the Gulf of Trieste on the Adriatic Sea. Throughout history it has been influenced by its location at the crossroads of the Latin, Slavic and Germanic cultures. Trieste was one of the oldest cities in the Habsburg Empire and in the 19th century it was the most important port of that member of the “Great Powers.” As a prosperous seaport in the Mediterranean, Trieste became the fourth largest city of the Austro-Hungarian Empire (after Vienna, Budapest and Prague). It underwent an economic revival during the 1930s and played a key role in the struggle between the Eastern and Western blocs after World War II. Today Trieste is one of Italy’s richest regions, serving as a center for shipping, shipbuilding and finance. 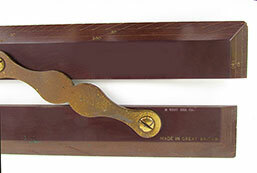 The venerable firm of Spencer, Browning and Rust was a prolific manufacturer of navigational instruments since the partnership was established in 1780. 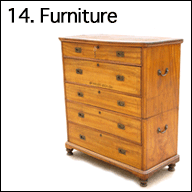 The name appeared in the London Directories between 1780 and 1784 as being at 327 High Street, Wapping, London. In 1798 the firm moved to 66 High Street and remained there into the 1840’s when the firm name became Spencer, Browning & Co. 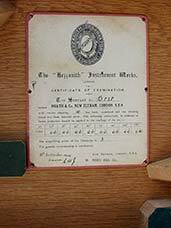 The partnership of William Gilbert and James Gilkerson was begun in 1793 as mathematical instrument makers and opticians at 8 Postern Row, Tower Hill, London. 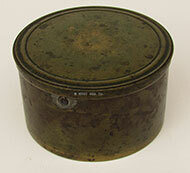 They were succeeded by Gilkerson & Co, in 1809. 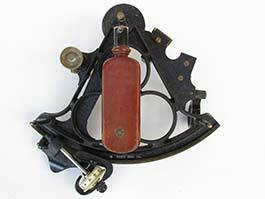 The partnership was known to have made and sold sextants, rules, globes and ring dials. 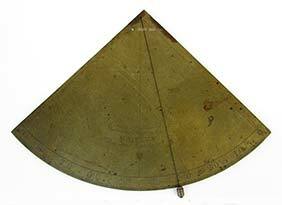 William Gilbert was heir to a long line of mathematical and scientific instrument makers beginning with his grandfather, John Gilbert (I) in 1719 and his father, John Gilbert (II) in 1751. 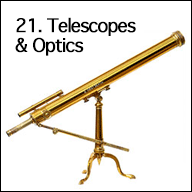 (Gloria Clifton, “Dictionary of British Scientific Instrument makers 1550 -1851,” 1995, Zwemmer, Philip Wilson Publishers, London). 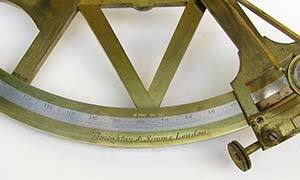 The search for “The longitude” in early 18th century England was encouraged by the Board of Longitude which offered a massive prize of £30,000 for the solution. 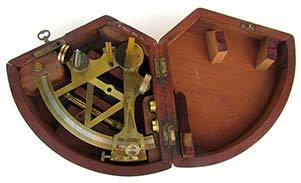 It spurred much innovative interest in celestial navigation. 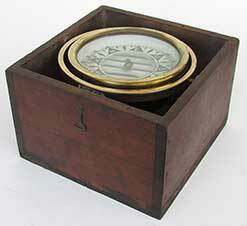 In May 1731 John Hadley, an English mathematician, presented a paper to his fellow members of the Royal Society in London describing the use of a double reflecting quadrant or "octant." 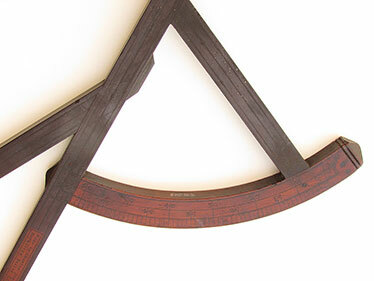 His quadrant was based on the principle of light reflection and angles of incidence that were described by Robert Hooke, Isaac Newton, and Edmund Halley in the previous century. The principle is that when the angle of a celestial object and the horizon is seen through a double reflection, that angle is condensed in half between the two reflecting surfaces. 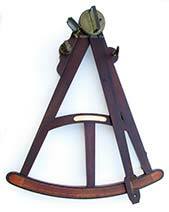 Thus Hadley's quadrant, reading to 90°, had an arc of only 45°, or one eighth of a circle, making it an "octant." 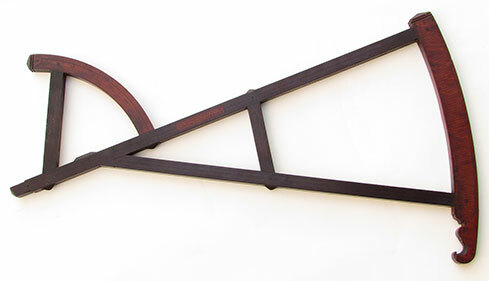 Basically the instrument consisted of a triangular wooden frame with a swinging index arm pivoted at the apex. A mirror was fixed at that point which would move with the arm. 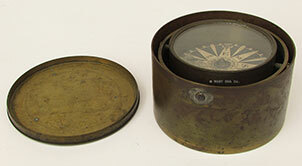 A second mirror, half of which was transparent so that the user could view the horizon, was fixed to one limb and a sight was attached to the opposite limb. 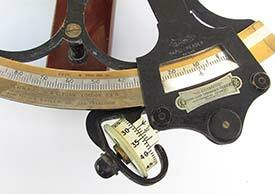 A precise scale, calibrated in degrees, was scribed on the arc of the bottom limb of the triangle, across which the index arm moved. 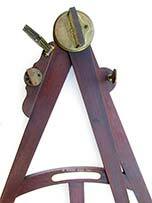 This continued to be the basic form of angle measuring navigational instruments for the next 250 years, and still remains, even with the advent of GPS! 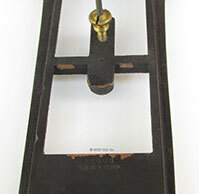 Quite independently of Hadley, Thomas Godfrey, a Philadelphia glazier and acquaintance of Benjamin Franklin, devised an improved altitude measuring device based on the same principle over a year earlier. 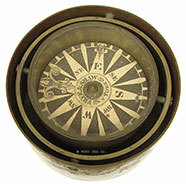 The instrument had been tested in the sloop TRUEMAN on voyages to Jamaica and Newfoundland from 1730-1731. The Royal Society recognized the equal contributions of both men and awarded them a prize of £200 each. 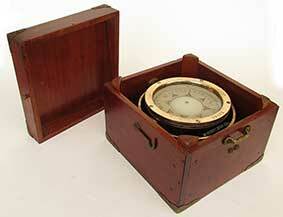 Godfrey also received a prize from the Board of Longitude (of chronometer fame) for his work. 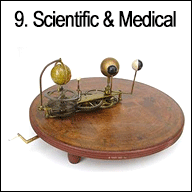 However it was Hadley who ultimately received the most credit for the invention. 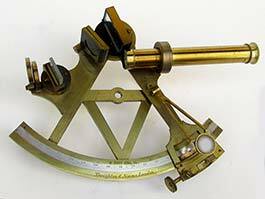 The improvements in navigation of the Hadley quadrant or "octant” as it came to be known, over previous instruments was immense. Not only was it more accurate, it provided simplicity of operation, and the ability to "capture" the object being sighted for rapid, multiple sightings. 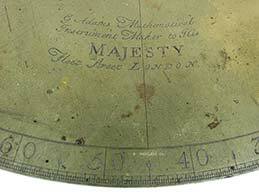 The merits of the quadrant were immediately noticed by the British Admiralty and its commercial production was begun. 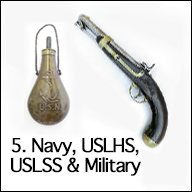 Even so, the instrument did not find popular acceptance and general use amongst traditionally minded mariners until after 1750. 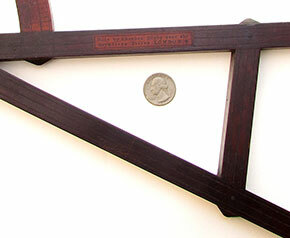 The earliest Hadley quadrants, like backstaves, were constructed of walnut or other indigenous woods, with the scales being engraved on boxwood (although examples on brass do exist). 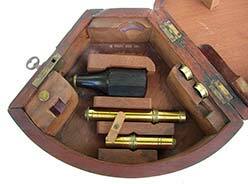 With the discovery and growing importation of exotic woods such as ebony, rosewood and African mahogany beginning in the 1750's, the use of mahogany was quickly implemented, gradually giving way to the exclusive use of ebony, then ultimately brass by the mid-1800's. 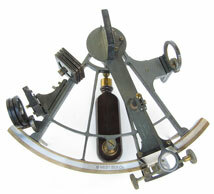 3.80 PRESENTATION SEXTANT. 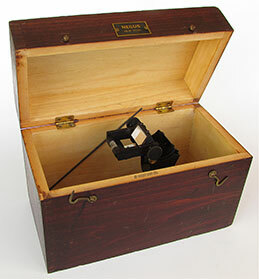 Truly exceptional first half of the 19th century British pocket sextant also known as a “box sextant.” This fabulous example of the early scientific instrument maker’s art is all brass, housed in its original mahogany case. 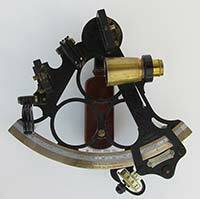 This maker of this precision instrument is identified with the hand-engraved signature “T. Dunn, Edinburgh.” It is inlaid with a scale of sterling silver calibrated in half degrees of arc from -5 to 140 marked by tens. 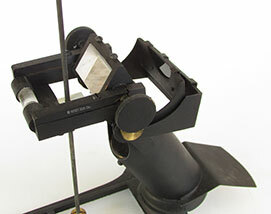 The fine silver vernier scale on the index arm provides an accuracy down to a single arc minute. To facilitate the minute reading a pivoted magnifier is provided. 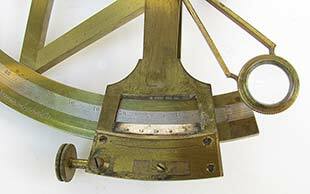 What is truly exceptional about this instrument, placing it far above most others of its type, is that it actually has a fine adjustment tangent screw, typically only seen in much larger sextants of the era. 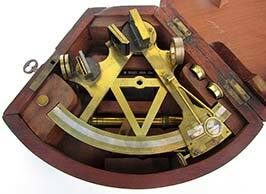 Cleverly, it also has two pivoting sun filers within the body, actuated by levers on the periphery of the case. 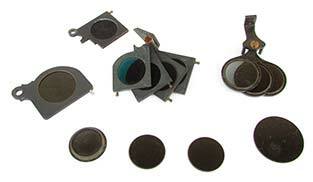 A removable sight is also provided, which rests in the case when not in use. 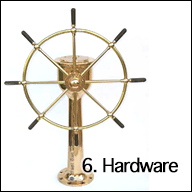 The instrument is encased in a knurled brass cover which hermetically seals it when not in use, and acts as a handle when screwed onto the other side. Adding more value and desirability it is beautifully engraved with the presentation “TO James Peddie FROM Geo.& Jas.s Gunn JUNE 1842.” The quality of the engraving is the finest we have ever seen! 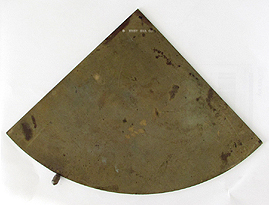 The instrument itself measures 3 inches in diameter and 1 ¾ inches thick. 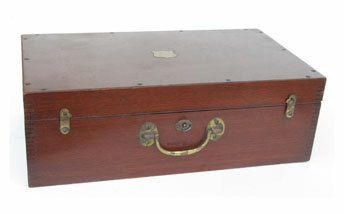 The mahogany box of splined construction with original brass hook and eye closure and inlaid brass plaque measures 4 by 4 inches and 2 1/4 inches thick. 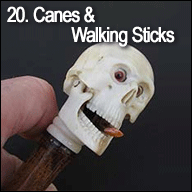 Remarkably pristine original condition after 174 years! 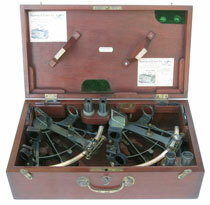 Certainly the finest box sextant we have ever had the pleasure of offering. 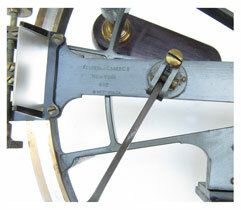 Gloria Clifton, author of “Directory of British Scientific Instrument Makers 1550 – 1851,” 1995, The National Maritime Museum, lists Thomas Dunn on page 90 as a Mathematical, Philosophical instrument maker and Optician, working first in 1843 at 50 Hanover Street in Edinburgh, Scotland then at 106 George Street through 1867. 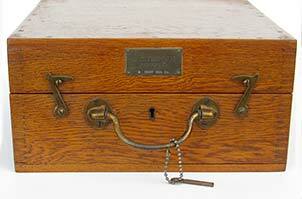 Thomas began his business with his brother, John Dunn II in 1841, who at the time was working in Glasgow. It is interesting to note that the presentation date of 1842 predates Thomas’s move to Edinburgh, apparently still in the employ of his brother. Two of the most highly regarded and comprehensive works on early navigation are books written by co-authors Harriet Wynter and Anthony Turner, “Scientific Instruments,” 1975; and by Peter Ifland, “Taking The Stars,” 1998. 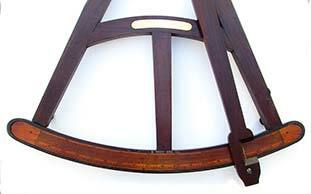 On page 70 Ms. Wynter writes, “One of the first elevation-finding instruments was the sea quadrant, first used by mariners in the fifteenth century. It was a simple arc of a circle made of wood or brass with two sighting pinnules along one straight edge, which were directed towards a celestial body. 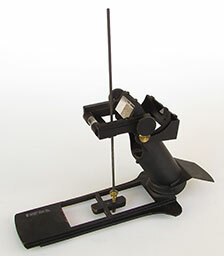 A plumb bob attached to the apex swings across an arcuate scale graduated 0-90o to show the altitude reading.” No photograph or likeness accompanies the text. 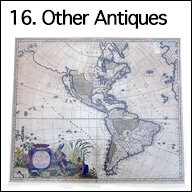 Provenance: From the estate of Captain “O. 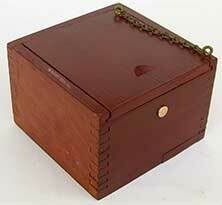 C. Thompsen, Berkeley,” California as hand-engraved on a brass plaque fronting the box. 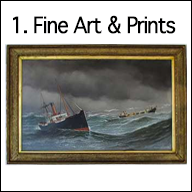 Provenance: From the estate of Captain “O. C. Thompsen, Berkeley,” California in the 1920’s. According to Gloria Clifton, author of “Dictionary of British Scientific Instrument Makers 1550 – 1851,” 1995, Philip Wilson Publishers, The National Maritime Museum, London, Ebenezer Hoppe was a mathematical and optical instrument maker working at Edward Street, Limehouse Fields, London in 1801, having been apprenticed to Michael Dancer in 1793. 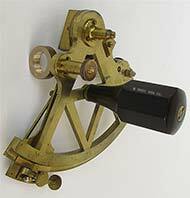 He was noted as the inventor of an improved sextant.